They reboot Star Trek and I shrug my shoulders. They reboot Superman and I shrug my shoulders. Am I stuck in the past? Am I an old fuddy-duddy? What made Star Trek:The Next Generation so good was that it was a continuation of the story; it was not a re-telling of what had been told. Granted, if you're twenty years old, the retelling of the original story seems brand spanking new; but for me? Can't we move on to something else? Man of Steel - note how they didn't even use the word Superman in the title - is a well crafted reboot, a sort of remake of the 1978 movie starring Christopher Reeves. However, while that film was entertaining in a not take yourself too seriously way, this reboot is going the route of the recent series of darker superhero films à la Christopher Nolan. Batman has set the bar. There is nothing wrong with more dark and less campiness (oh how stupid Batman had gotten before Nolan), but Man of Steel left us with a bit of a mishmash in a nonlinear story. Parts of the story were good and parts of it were not so good so as a result, the film isn't as good as it should be. Nevertheless, if you're twenty and have nothing to compare it to, you may be expounding on the fine nuances of character development and how it affects the meeting of the American industrial military complex and a super-human from another planet. Talk amongst yourselves then hand in a thousand words double spaced. Henry Cavill makes for an excellent lead (Man, is he buff!). Russell Crowe had some pretty big shoes to fill by replacing none other than Marlon Brando from the 1978 but requisite gravitas to carry it off. Others of note are Kevin Costner and Diane Lane as Jonathan and Martha Kent, Laurence Fishburne as Perry White, and Michael Shannon as General Zod. All of these people and the retelling of the Superman story were well done. However the writers did deviate from the original story in some details, as I said to add a darker feel to the movie. Oddly enough, there is just about no romance between Superman and Lois Lane. Surprise, surprise, dark wins. The final confrontation between good and evil, in this case between Superman and General Zod went on far too long and was a confusing, unsatisfactory ending to the film. Did somebody decide to throw tens of millions of dollars of special effects into the fray in the hopes of creating a spectacular ending? It didn't quite work. Way, way back in time, back in the early comic book years, Superman, and all the so-called superheroes for that matter, were smaller characters; they were more like us mere mortals. Slowly, the writers upped the ante making them all more and more super and less and less mortal. Superman was originally super but became omnipotent. The Superman I grew up with would stop to rescue a cat from a tree and return him to a concerned little girl. Now, he's so powerful, he can literally shift the orbit of a planet and remake a universe. The Superman I grew up with would fight villains who were mortals doing bad things. Now the villain has the power to destroy all of Earth and its inhabitants. Superman is working on a level way beyond us. His powers are truly all-powerful and his adversaries would squash us all like mere bugs. In this movie, Jor-el, the biological father of Superman, says that his son will be a god to the people of Earth. I think therein lies the problem which has grown over the decades. The writers have made this character so powerful he is now omnipotent. I want to identify with the character. I'm entertained by James Bond because there is the slight, although far-fetched notion that I, or somebody like me growing up in different circumstances, could be James Bond. There is no way I'm going to come from another planet and possess god-like abilities under the rays of this yellow sun. The premise has now made the story more and more difficult to identify with. I am sure that many do not know that even Batman has grown more and more super-y. While under the guidance of Christopher Nolan the character returned to its dark roots, Batman is now an equal to Superman. Batman first appeared in 1939 in Detective Comics; I will emphasise the word detective. First and foremost, he was a detective, albeit a super-detective. He fought crime using special abilities but he was fighting the type of crime you or I are familiar with. While I enjoyed the villain Blane of the last Batman movie, admittedly Blane is stretching credibility with his seemingly infinite supply of resources. The 1978 Superman film starring Christopher Reeves was a great film as it managed to humanise the superhero. Yes, he had superpowers but he also had to juggle a job and get the girl. Man of Steel attempts to do the same but doesn't quite succeed. Unfortunately for me, the nemesis turns out to be pretty much omnipotent himself and Superman turns out to not be the superhero as a model I want to emulate, but a god who is way past anything I can bring or the rest of Earth can bring to the table. I used to read Mr. Ebert's reviews to compare his take on a movie with my own. He died on April 4, 2013 but his web site continues with regular reviews being penned by various writers. I'm keeping this little literary overview of the film under a thousand words, but the guy on the Ebert site wrote twenty-one hundred! I joked earlier about a twenty-something expounding on the fine nuances of character development. Ha, ha. It is just a movie. Here's a look at how Superman has fared over the years as a superhero franchise. FYI: I just checked the numbers. The last Batman movie, The Dark Knight Rises (my review), had a budget of upwards $300 million and whose worldwide gross is now listed at over one billion dollars. I read my first Superman comic long ago in a galaxy far far away and am more than just familiar with the story of our flying hero. For me another retelling of the same story doesn't cut it. I wouldn't mind seeing something new. Overall, the film is well done but the final fight scene is bit of a mess and way too long. Personally, I wouldn't recommend this film. But if you're taking your kids, you won't mind it and for the ladies, there are a few cheesecake shots of the star. Excuse me, I think I need to slip out to the gym. Superman's return to the big screen is mostly successful, as Man of Steel provides enough exhilarating action and spectacle to overcome its occasional detours into generic blockbuster territory. Man of Steel is a 2013 American superhero film directed by Zack Snyder, produced by Christopher Nolan, and scripted by David S. Goyer. It employs non-linear storytelling. 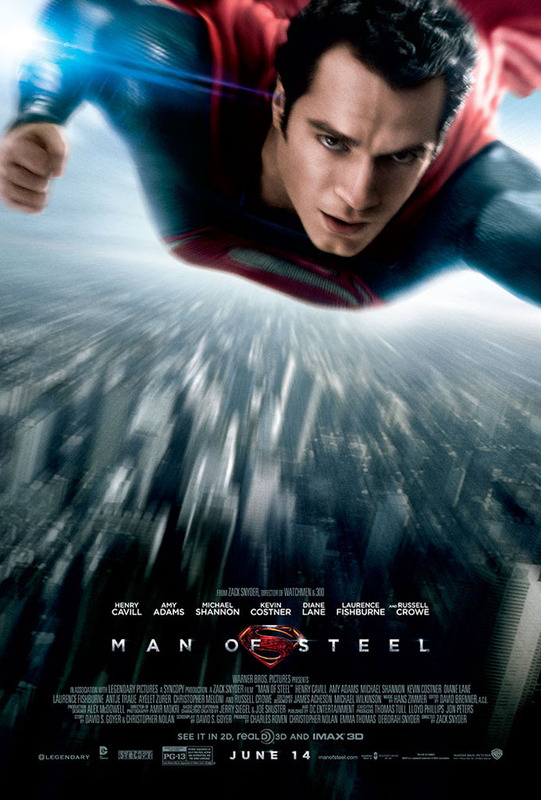 Based on the DC Comics character Superman, the film is a reboot of the Superman film series that portrays the character's origin story. The film stars Henry Cavill in the title role with Amy Adams as Lois Lane, Michael Shannon as General Zod, Diane Lane as Martha Kent, Kevin Costner as Jonathan Kent, Laurence Fishburne as Perry White, and Russell Crowe as Jor-El. Man of Steel is intended to launch a shared fictional universe of DC Comics characters on film.